Lanfranco Aceti, the founder of OCR, Edward Colless, Head of Critical and Theoretical Studies, and Paul Thomas, Program Director of Fine Art at COFA, are the lead chairs and organizers of the conference Cloud & Molecular Aesthetics from June 26 to 28, 2014, at the Pera Museum. We invite you to three stimulating days that explores new perspectives and evolutions in contemporary art were acclaimed professionals including curators, historians, creative arts practitioners, critics and theorists consider transdisciplinary imaging relating to the theme of cloud, dispersal, infinitesimally small and molecular aesthetics. The conference keynotes are Professor Anne Balsamo, Dean of the School of Media Studies at The New School, Dr. Ljiljana Fruk co-author of Molecular Aesthetics, Dr. Jussi Parikka who authored Insect Media: An Archaeology of Animals and Technology; and Prof. Darren Tofts author of Alephbet: Essays on Ghost-writing, Nutshells & Infinite Space. Highly regarded international speakers will present their current artistic, curatorial and critical practices that exist across various transdisciplinary fields. OCR, Operational and Curatorial Research, as the organizing research center wishes to acknowledge the support of a range of prestigious institutional partners that include Sabanci University; Kasa Gallery; the Pera Museum; College of Fine Arts, University of New South Wales; the National Institute for Experimental Arts; the University of Melbourne; the Victorian College of the Arts; i-DAT; Goldsmiths College; and Leonardo/MIT Press. 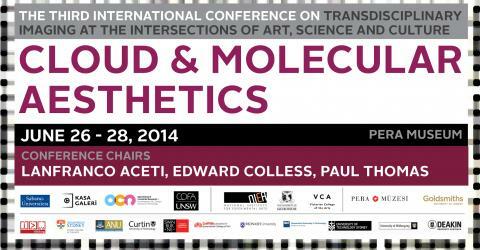 The conference Cloud & Molecular Aesthetics is part of a series of the Transdisciplinary Imaging Conference at the Intersections of Art, Science and Culture.